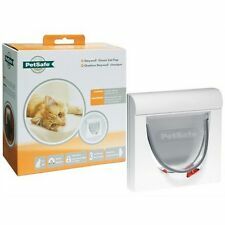 Petsafe Staywell Microchip Cat Flap White Easy to Program Door with 4 way lock. The PetSafe® Microchip Cat Flap works by reading your cat’s unique microchip ID without the need for a collar or accessory. can also use Petsafe R.F.I.D. collar keys (PAC19-20560). • Fits windows & glass doors, single & double glazed Suitable for cats up to 8 kg. 4.5 out of 5 stars - Petsafe Staywell Microchip Cat Flap White Easy to Program Door with 4 way lock. 8 product ratings8 product ratings - Petsafe Staywell Microchip Cat Flap White Easy to Program Door with 4 way lock. 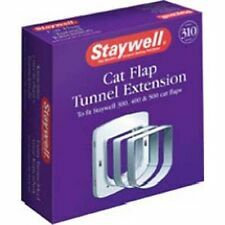 Staywell Large catflap / Small dog flap - 4 way locking pet door - still in box and never been used. Box is slightly bashed but contents all fine. 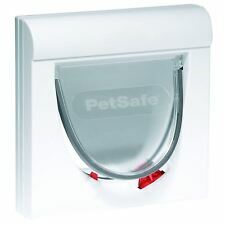 Petsafe Microchip Cat Flap White Easy to Program Door with 4 way lock. Petsafe Microchip Cat Flap in White. Easy to Program Door with 4 way lock. 4.5 out of 5 stars - Petsafe Microchip Cat Flap White Easy to Program Door with 4 way lock. 8 product ratings8 product ratings - Petsafe Microchip Cat Flap White Easy to Program Door with 4 way lock. 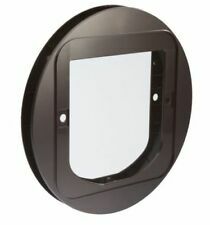 SureFlap SUR001 Microchip Pet Door - White With Hub. Condition is Used. Dispatched with Royal Mail 2nd Class. Used for a year, but no longer have cats. 170mm x 178mm flap opening size. Comes with all original accessories. Batteries not included. Hardly used. 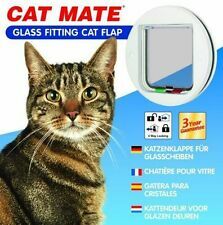 Brown Cat Mate locking cat flap. Flap opening is approx. Cat flap that works with your cat's microchip. The flap & instructions only, does not include any other mounting hardware. There are no included screws, nut & bolts, tunnel, panel or any other bits. PetSafe Staywell 4 Way Locking Deluxe Cat Flap Grey - Great Value Cat Door. Condition is New. Never used , box is faded , but contents not affected Dispatched with Royal Mail 2nd Class. PetSafe Staywell Classic Cat Flap 4 Way Locking Manual System. Suitable up to 7kg, 162mm shoulder width. Brand new- purchased in error, still in box. Installation guide included. Dispatched with Royal Mail 2nd Class. Important information: The PetSafe Microchip Cat Flap reads the most common type of microchip implanted in cats FDX-B (15-digit). 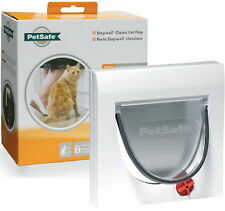 PetSafe Exclusive Entry Microchip Cat Flap. Does Not Have Fixing Screws. 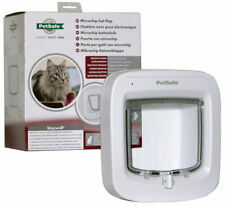 PetSafe Staywell Deluxe Manual Cat Flap. 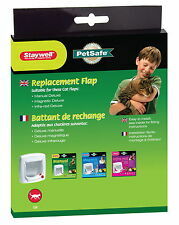 1 X PetSafe Staywell 4 Way Locking Deluxe Manual Cat Flap. Setting the Pet Door to fully locked or out only also prevents strays or unwanted animals from getting inside. PetSafe Staywell, Weather Proof, Aluminium Pet Door, Large. WARRANTY - The PetSafe Staywell Aluminium Pet Door includes a 3 year manufacturer's warranty. WEATHER PROOFING - In high Wind the Magnetic closing Door and pile Weather Stripping prevent flapping keeping a Tight, Weather Proof seal around the opening.